Bank Interest Certificate might be needed for various purpose, as well as some people might need it to file their ITR. So if you need your Bank Interest Certificate then there is no need to visit your SBI Branch. SBI Online Banking Offers feature which allows you to download your SBI Interest Certificate Statement Online in few clicks. So today in this post we will guide you out on how to get (State Bank of India) SBI Interest Certificate Online. To be able to download your SBI Interest Certificate Online, you should have Online SBI Internet Banking Activated. If you are having this service activated then well in good or if you still have not activated SBI Net Banking then you can register for it by clicking here. Login into your Online SBI Internet Banking by clicking here. To download your State Bank of India Account Interest Certificates Online just go to e-Services tab and click on Certificates. Here you will be able to access all type of Interest Certificates like Home Loan Interest Certificate, Interest Certificate on NRI deposit A/Cs, Home Loan Interest Certificate (Prov), Interest Certificate of deposit A/Cs and Education Loan Interest certificate. You can just click on whichever type of Interest Certificate which you want to view and click on download button to download the statement in PDF or HTML Format. 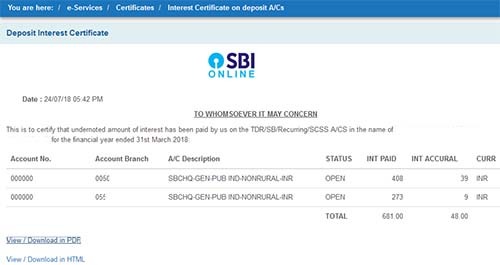 If you want to download Interest Certificate of TDR/SB/Recurring/SCSS A/CS accounts then you will have to click on Interest Certificate of deposit A/Cs and download the certificate of the previous financial year. That’s it, this is how you can get SBI Interest Certificate Online without visiting the branch in few clicks online.